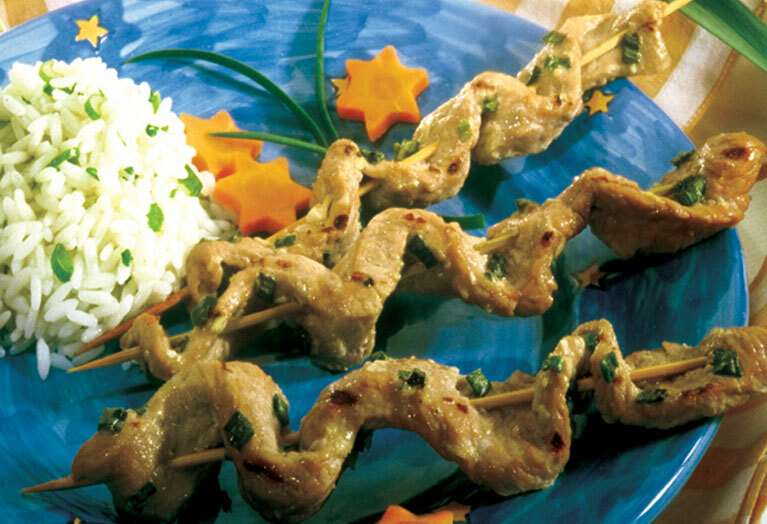 Make sure a nutritious and delicious dinner fits into your evening fun with Sesame Veal Strips. Whip up the simple marinade and let the veal strip marinate for at least a half an hour. Grill or broil and that’s a wrap on dinner. Enjoy! In small bowl, combine marinade ingredients; mix well. Stack veal cutlets; cut crosswise into 1-inch wide strips. Place veal and marinade in plastic bag, turning to coat. Close bag securely and marinate in refrigerator 30 minutes to 2 hours, turning occasionally. Soak 10 to 12 bamboo skewers in water 10 minutes; drain. Remove veal from marinade; discard marinade. Thread an equal amount of veal, weaving back and forth, onto each skewer. Do not crowd. Place kabobs on grid over medium, ash-covered coals. Grill, uncovered, 4 to 5 minutes for medium doneness, turning once. Chef’s Tip: *To broil, place kabobs on rack in broiler pan so surface of meat is 4 inches from heat. Broil 3 to 5 minutes or until cooked through, turning once. 91 mg cholesterol; 1 mg iron.